Thank you to everyone who supported the AIC with our Hurricane Matthew Relief Efforts during October and November. Collectively, we were able to meet immediate needs of many citizens of the Lumbee Tribe of North Carolina in one of the hardest hit areas of the state, Robeson County. We could not have done this without your donations of supplies! As of December 1, we are officially no longer collecting donations as a drop-off site. Our activities have shifted to meet the evolving needs of the community as they are now entering into a community rebuilding phase. As communities across eastern North Carolina deal with the aftermath of Hurricane Matthew, efforts continue at Carolina to aid in many aspects of recovery. Individuals and groups of staff, faculty and students have already made several relief trips. The Carolina Center for Public Service, together with campus and community partners, is organizing campus-wide relief trips to affected areas. These trips are for UNC staff, faculty and students who are willing to help with clean-up or who have specialized building and repair skills. The first relief trip is Friday, Dec. 9 to Tarboro, North Carolina. Another trip to Garland, North Carolina is planned for Dec. 16 in partnership with the Center for Health Promotion and Disease Prevention. For details and to register, visit UNC disaster relief trips. The Carolina Center for Public Service convened a Hurricane Matthew Recovery Working Group in late November with representation from various campus units to help coordinate campus efforts to support communities impacted by the extensive flooding in North Carolina. The working group plans to meet again in January. For more information, contact ccps@unc.edu. The website http://ccps.unc.edu/HurricaneMatthew is updated daily and has much more about Carolina’s efforts and other information and resources. Please send website announcements, updates and information to ccps@unc.edu. The greatest need the community has come back with is to support the schools opening back this week. Teachers are in need of supplies to recoup and to reequip students with supplies. There is also a call for cleaning supplies, rubber gloves and face masks to clean up during the recovery efforts that have started. Food is always needed especially with the holidays coming. Tribal partners have indicated a need for baby supplies, such as diapers, wipes, and baby food. Tribal partners are requesting a temporary cease to clothing donations at this time, and a focus on non-perishable foods and the other items listed below. Thank you to everyone who donated clothing items! Personal hygiene products are in big demand! Tribal and community volunteers are creating toiletry bags – washcloth, soap, shampoo, conditioner, brush/comb, toothbrush, toothpaste, deodorant, body wash, lotion & razors. The shelters and organizations have temporarily stopped taking clothes. However, specific request have been made for larger size XL and plus size women’s clothes. There has also been a request for brand new adult underwear in unopened packaging. Any blankets, pillows and towels need to be brand new. Cleaning supplies are also being requested. Families are cleaning out their homes, refrigerators, kitchen items and washing clothes. Specifically, laundry detergent and dish washing liquid along with sponges, cleaning clothes, and rubber gloves with other cleaning items are needed. There are students who lost all school supplies: Notebooks, pens, pencils, folders, markers, colored pencils, and crayons. Lastly, organizations have also requested reusable totes, draw string backpacks, large and extra-large zip lock bags, etc. to back up supplies and make the personal care kits for distributions. It would be great to request stores and corporations to donate reusable shopping bags for parish members that work in those businesses. The Churches are conducting community walks where they are canvassing neighborhoods and handing out items to those that were not evacuated to shelters, but still have no power or running water. The members are doing this service are needing to be cautious of their personal safety. MANY THANKS TO ALL WHO BROUGHT IN ITEMS THIS WEEKEND FOR DELIVERY TO THOSE IN NEED!!! Additionally, financial gifts can be made to support tribal communities through Carolina’s Disaster Relief Fund (010779) on the American Indian Center’s website by clicking here. We are in daily communication with tribal leaders and community members and will tailor supply purchases as needs evolve. Our hearts and thoughts are those living in the Lumbee Tribal Territory, which was the most severely affected On behalf of the UNC American Indian Center and NC Native nations, we are grateful for your support. To facilitate communication about efforts and resources, Chancellor Folt has asked the Carolina Center for Public Service to help coordinate these efforts. The best source of updated information will be posted on a dedicated website at ccps.unc.edu/HurricaneMatthew. 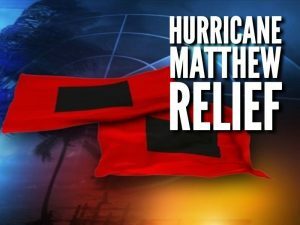 The North Carolina Bar Association is partnering with the American Bar Association, FEMA and Legal Aid of North Carolina to operate a Disaster Legal Services Hotline for those impacted by Hurricane Matthew in Beaufort, Bertie, Bladen, Columbus, Cumberland, Edgecombe, Hoke, Johnston, Lenoir, Nash, Pitt, Robeson, Wayne and Wilson Counties. The hotline is available weekdays from 9 a.m. to 4 p.m. Those in need of assistance should call 1-800-662-7407 , identify that they need help with a matter related to Hurricane Matthew, ask for Disaster Legal Services, and identify the county in which they are located. Individuals who qualify for assistance will be matched with North Carolina lawyers who have volunteered to provide free, limited legal help. Survivors should be aware that there are some limitations on disaster legal services. For example, assistance is not available for cases that will produce a fee (i.e., those cases where fees are paid part of the settlement by the court). Such cases are referred to a lawyer referral service.